When you’re building your own onboarding flow, it’s helpful to familiarize yourself with some user onboarding best practices – how other companies are signing new users up, how they’re demonstrating progress to the user, etc. User onboarding is the process of interacting with users to increase user engagement and help facilitate their transition from new user to product advocate. Successful user onboarding often takes place across various channels and can significantly impact a user’s long-term interactions with a product or service. What user onboarding is right for your product? Everything depends on the type of product you have. Some patterns work fantastically well for consumer apps, but just won’t make sense in a B2B product. On top of that, if you have a product with tens or even hundreds of millions of active users, you’re going to have to successfully onboard customers from across a wide spectrum of different skills and abilities. Some users don’t necessarily want to do the things you need them to do to become successful. You’ll need to balance the user experience of onboarding with the friction of necessary steps such as account creation, user education, and data gathering. It’s no small challenge. That’s why we’ve put together a walkthrough of some of the most successful patterns – to explore what patterns work and when, to get you thinking about the right onboarding experience for your product or app. Social login offers users one-click sign up – just create an account with pre-existing social profiles like Facebook, Twitter, Google, or LinkedIn. Social login combats one of the biggest issues facing users when they sign up – account fatigue. Social login provider Janrain found 92% of people have left a website instead of resetting or recovering login information. If your goal is any form of virality, social login is a must. Put simply, it increases the rate at which Monthly Unique Users (MUU) are becoming Monthly Authenticated Users (MAU) – that means a higher percentage of monthly visitors are actually signing up and logging in. Social login also lets you access and connect to a user’s contacts. Instead of asking users to manually input their contacts and build a profile from scratch, leverage the existing network’s infrastructure. With some simple API and export features, users can get off to an easy start. One-click social login works. 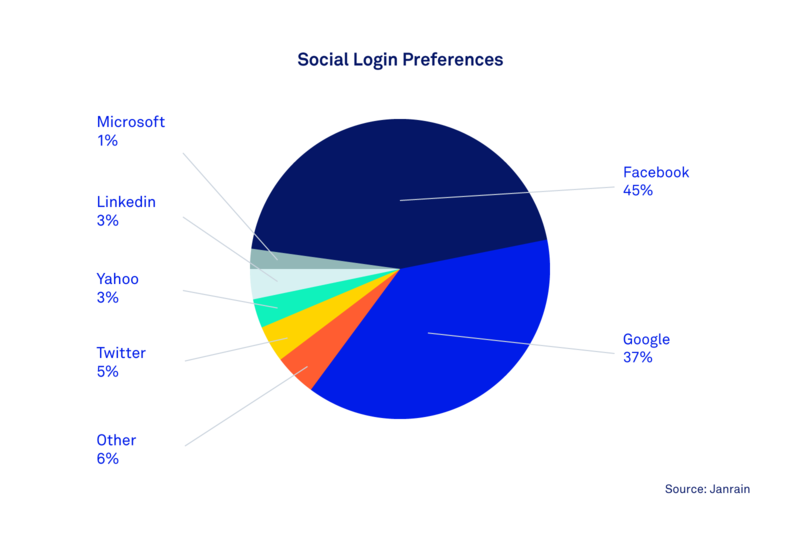 But which social login options are right for your app? Much depends on the your product. For example, Facebook is the most popular option across consumer brands, retail, music and social media services. For B2B applications, Google is the most popular. So make sure you choose the social login model that best matches your customer base. All successful consumer products have created habit-forming experiences, or so called “desire engines”. The more often a user completes these experiences, the more likely they are to “self-trigger”. You can add these desire engines to your onboarding so users form habits that will keep them coming back to your application. Take Pinterest. Their desire engine is getting users to pin items they find interesting. It would have been easy for Pinterest to force users to click through a step-by-step onboarding tutorial. But Pinterest doesn’t place users into the tutorial immediately. They let you explore at your own pace and wait until the user clicks an image in their content feed. This triggers the tutorial. These types of contextual tutorials give users their first taste of customer success and kickstart the desire engine so they keep on pinning. 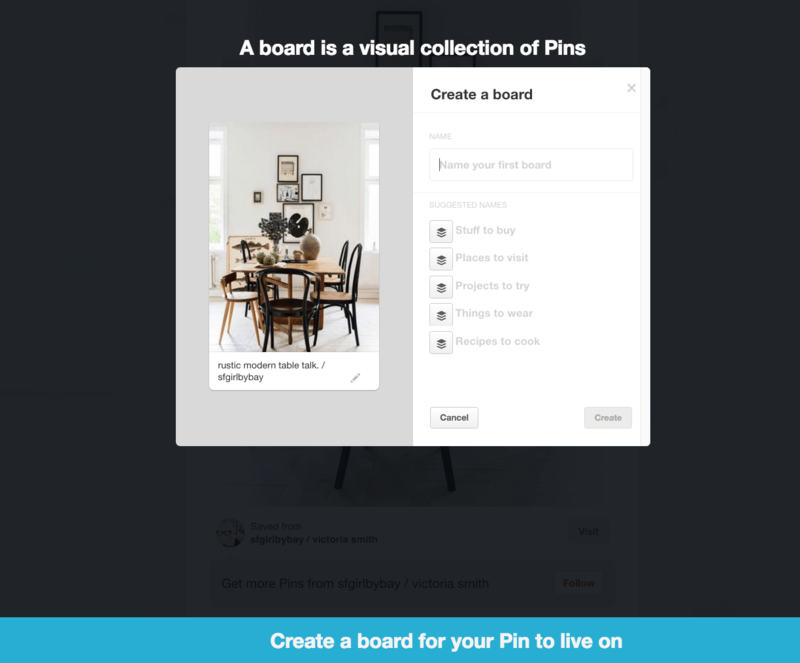 It’s also important to note Pinterest introduce the concept of pinning and boards. Even when users have successfully pinned an image, they’re probably at greater risk of not returning if they don’t understand these larger concepts. If your application relies on a new concept without established patterns of behavior, be sure new users don’t leave until they understand it. Whether it’s numbered steps, a task-style checklist, or a progress bar, giving users a sense of how far they have to go to complete the user onboarding process helps reduce abandonment. If new users know how many next steps they must complete, they’re more likely to successfully complete the process. Companies like Spotify, LinkedIn, Facebook, and Intercom all provide numbered steps to preview and track new user’s progress through their product’s features. A simple onboarding flow might give you lots of signups, but lots of signups doesn’t always translate to lots of customers. That’s why the best products don’t stop with a product tour. They focus on the job the customer is hiring your product for, and show customers how to be successful with it. Twitter is a great example of this. Whether or not a user follows other people on Twitter is an important indicator for user retention. So Twitter encourages you to follow at least 20 other users with a single click to make sure you get the most out of the product. New users are first shown a checklist of topics to choose from, with “popular accounts” already selected. New users that follow people and topics of interest are more likely to continue using Twitter, so they make it easy right from the start. One of the best ways of reducing friction in account creation is allowing users to progressively build their profiles. You do this by requesting only the most important and necessary information during registration. It’s a tricky balance to strike. Ask too much of new users and they may not complete the process. Don’t ask enough and you’re likely to experience customer churn. Requiring just enough information increases the odds of retention. “Just enough” information means you won’t be giving users the complete experience from your product right away. You can see this tactic in the way LinkedIn, Facebook and Tumblr give users easy opportunities to build their profiles over time. LinkedIn does this by assigning user profiles a strength rating. The rating is displayed on every user profile, with a call to action (CTA) to “Improve Your Profile Strength”. This gives users the chance to complete elements of the profile they left incomplete during their initial onboarding. With each step they complete, users are rewarded with an improved strength rating. As we’ll examine later though, progress should be based on what the user wants to do, not what the business wants them to do. The way software is being bought is changing, and the buyer for a company often starts as an individual user. Collaborative, team-based SaaS products like Asana, Dropbox and Slack know the sooner they can connect these individual users to a team the more momentum they build toward a premium upgrade. 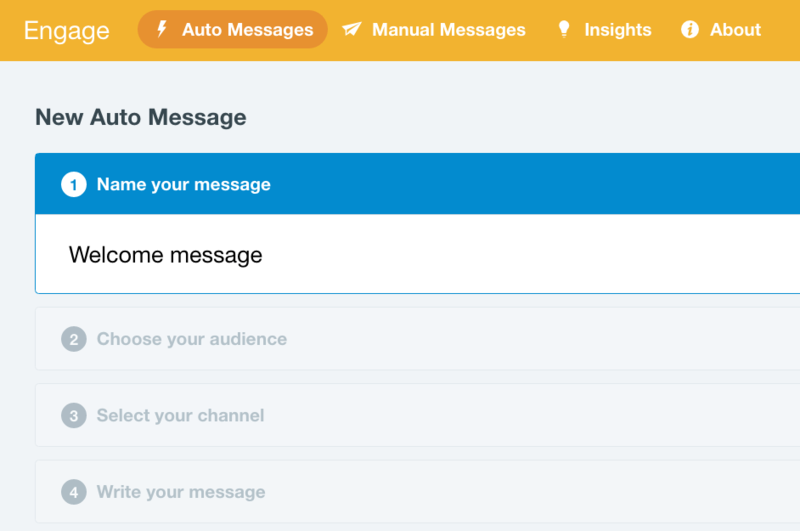 In each of these examples, when signing up with an email domain others have already used, new users are prompted to connect with teammates on the same domain. “Ask to join” and “Find your team” are common ways to encourage users from a company, who may not know their colleagues are considering the same tool, to connect. 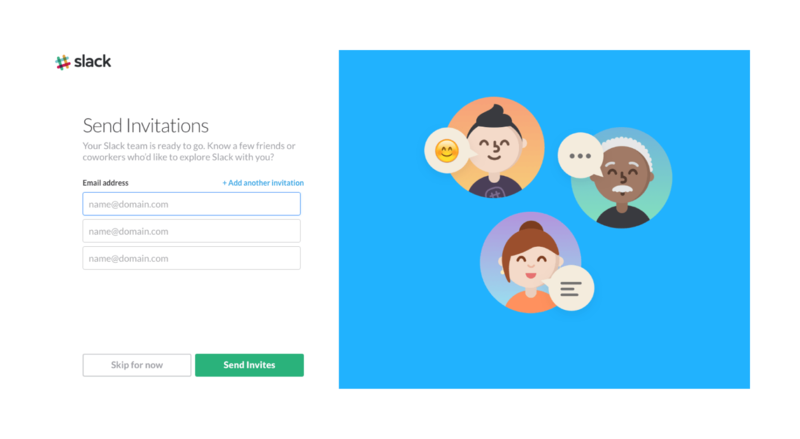 Slack builds its teammate invitation right into the onboarding flow prior to letting you use the product. In this case, teammates make the tool valuable. With a simple opt in, Slack allows new users to let their teammates join without additional permissions if they’ve created an account using a verified company email address. Making these connections between users and their teams can really help a whole company get onboarded to your product. What do you need to know about your users to provide them with a great experience? What do they need to do to get value from your application? What are the costs and benefits of adding friction to your customer onboarding process? How will you motivate users to complete it? At what point in your users’ lifecycle does onboarding need to be completed? What actions must your users take regularly to drive growth and revenue? Answering these questions takes time and experimentation. But these examples give you a sense of where you should start.